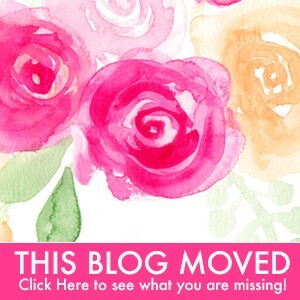 Matching stationery is available as always! 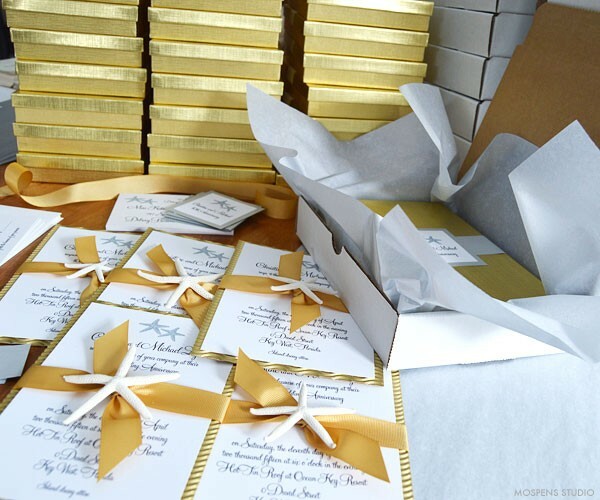 Think save the dates, place cards, menu cards, wedding programs and more. 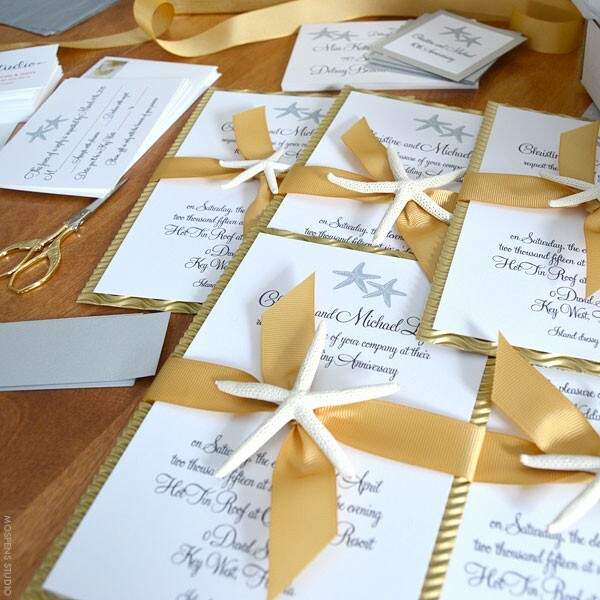 Gorgeous Gold Beach Theme Anniversary Party Invitations – The design features original starfish art, custom made gold metallic wave board, hand tied grosgrain ribbon bow, gold metallic invitation boxes wrapped with a silver metallic belly band and personalized tab. 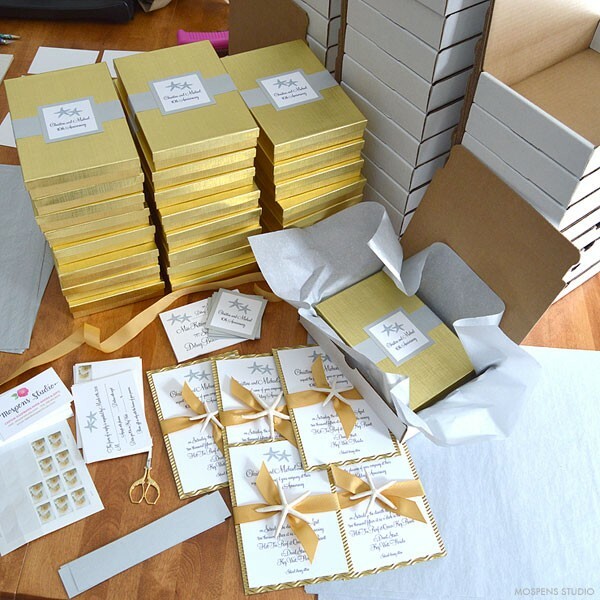 Each boxed invitation is wrapped in silver tissue paper, sealed then wrapped again in silver tissue paper then individually boxed. 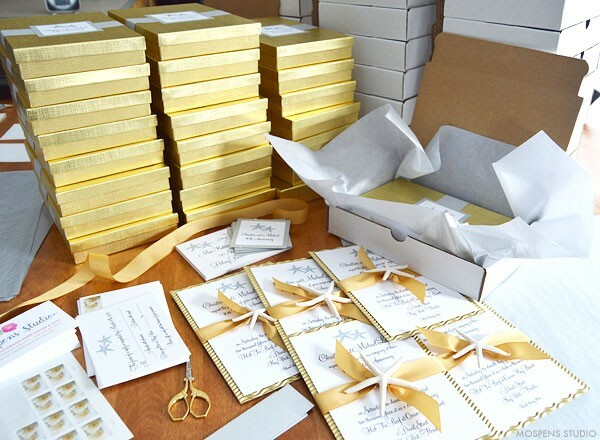 Ensuring the luxe invites are delivered in perfect condition to guests. Beautiful beach theme invites perfect for a 10th anniversary party. Available in almost any color combination for all events. Do you love these? Want them for your next event? Contact us today. 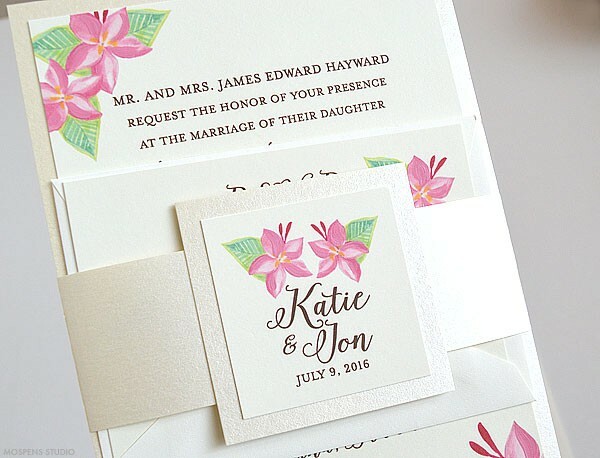 Gorgeous Pink Floral Wedding Invitations! 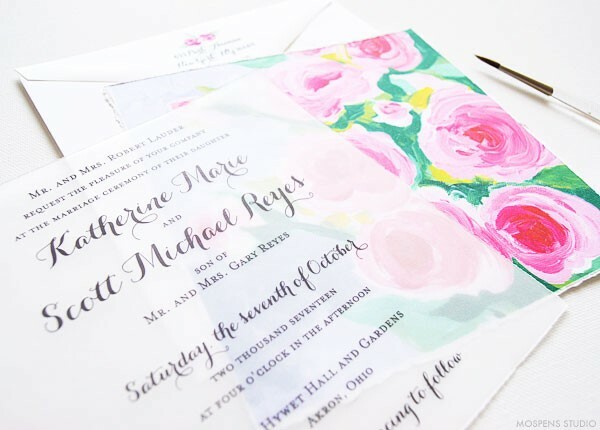 This handmade wedding invitation is also an art print for your guests to keep! A true keepsake. The vellum overlay is printed with your text. When your guests move the vellum they are gifted with an art print to keep forever. Floral Wedding Invitation Suite with original hand painted pink roses flower art, hand torn edging, and hand tied ribbon! Luxe + Handmade. 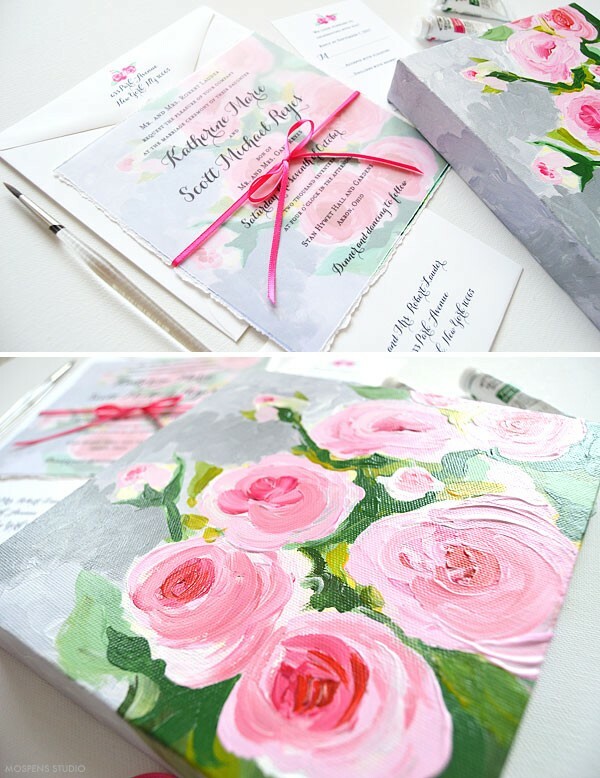 This invitation design first starts with an original hand painted acrylic rose painting on canvas. We carefully scan in the fine art. Each invite is then printed stroke for stroke. Then EACH invitation is ACTUALLY hand painted to give texture and that handmade FINE ART finish. The roses are available in blush pink, peach orange, and lavender purple. 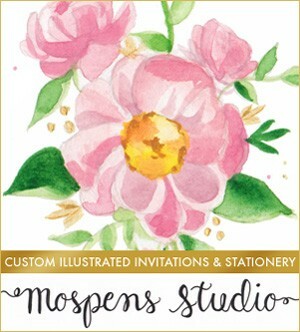 Font styles, ink color, flower color, and text can be customized by either James or myself after you order 25 invitations or more. A proof preview is provided after you order. 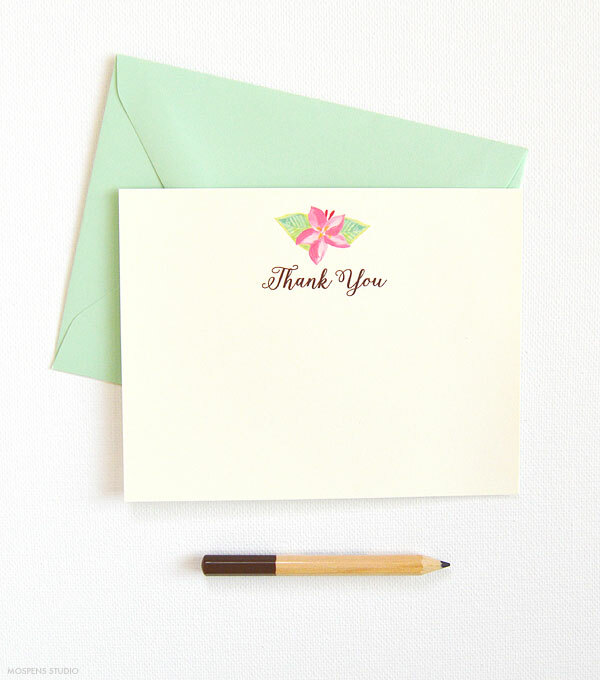 We only print your invitations after receiving your final approval to print. 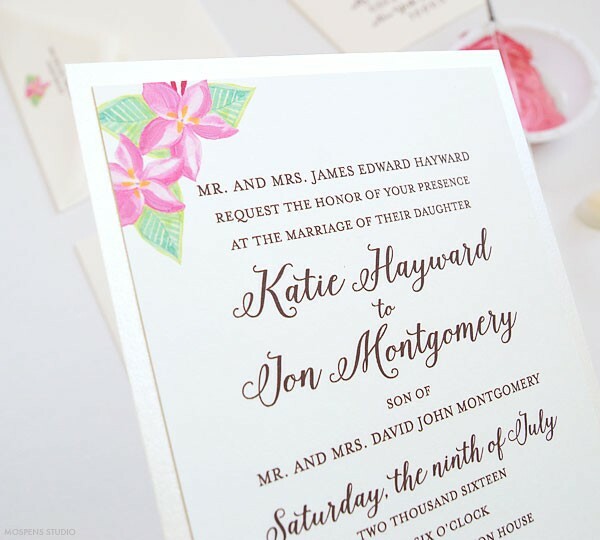 Shown here as a wedding invitation, this invitation design is also available as a birthday invitation, bat mitzvah invite, rehearsal dinner invitation, and any fabulous party invite. The CHESAPEAKE BAY Design is perfect for your nautical crab themed wedding in Maryland or seaside. 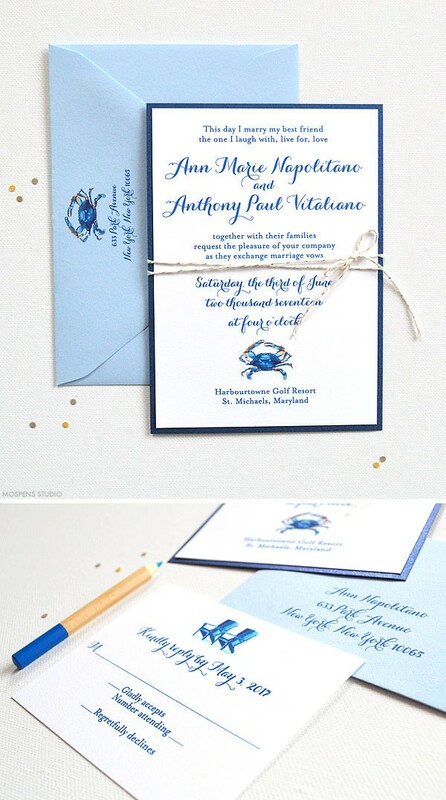 Blue Crab Watercolor Wedding Invitations – The design features original watercolor blue crab and beach chairs art, layered with sparkling sapphire cardstock, and a hand tied sweet silver and white ‘nautical rope like’ twine bow. 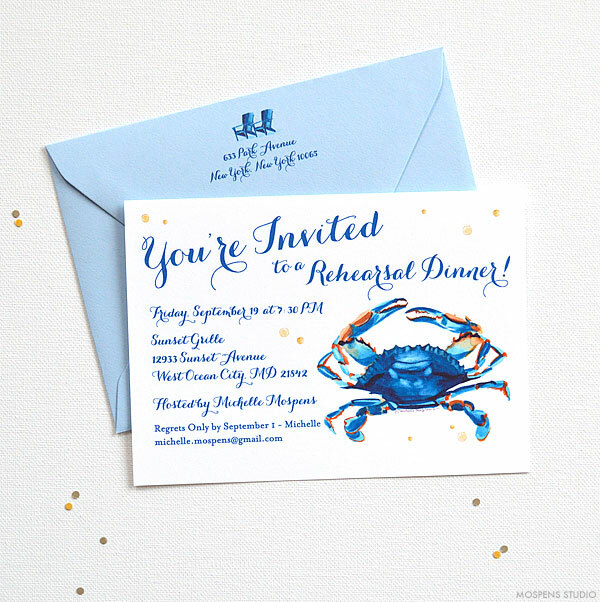 Matching blue crab reply cards, menus, place cards, wedding programs, thank you cards, and more available to complete your suite. You may also love The CHESAPEAKE BAY Design in our pocket folder style.